I was born a “junker” here in Wisconsin. I love seeing how I can repurpose as many materials as possible: second-hand leather purses & belts, ceramic shards (inspired by a post-earthquake & tsunami trip to Japan), guitar & harp strings, second-hand & vintage tins… you name it! Then, I love most to turn them into jewelry! My name is Becky Simington and I live locally in the village of Elk Mound. I have two wonderful boys who keep me going! 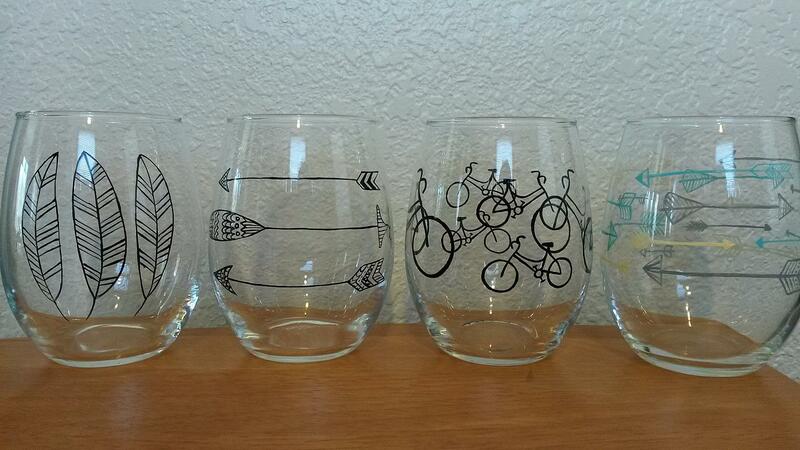 I love decorating wine glasses for parties, weddings or just a matching set for your kitchen!! I live in Spring Valley, Wisconsin and work from my home studio "cupboard under the stairs". I have a masters degree in health education, but after taking over 60 hours of metal smith classes, the torch and metals won the fight. I love mixing metals with Lake stones and birch bark for a simple, natural look. My name is Denise Anderson. I love working with fabrics. I started out helping my daughter with a fundraiser. I named our little fundraiser Carly's Choice. (After my daughter.) Our purses became so popular I continued to create new purses and totes. Since he was a child, Devin Johnson has been taking things apart. His desire to disassemble & explore old, broken, & reused things led him to creating wearable art & other accessories. Each material is a unique artifact; he chooses those that are beautiful not only for their colors & textures, but also for their historical & technological significance. These characteristics, which are often very mechanical & industrial, are brought to the surface as Devin forges each into a finished work. I always wanted to be an artist, but I can't draw to save my life. Then I learned how to knit to fulfill a bet with a college friend. Suddenly I found my creative outlet, I get to "paint" with yarn. I love watching people get excited to wear something I created. Our string art is based on the outline of the state of Wisconsin. Using the clients hometown as the focal point. We also create other pieces of art with old windows. Color and Cloth are my inspirations. Just sitting at the sewing machine composing funky, useful things that might bring a smile to anyone who receives them, makes me happy. I have two loves in my life, animals and art. On the first part of life’s journey I worked with animals as my main focus, veterinarian technician, boarding kennel owner, groomer, obedience trainer and rescuer/foster while always enjoying different forms of art. Now my focus is art, fulltime. During my 30 year career as a kindergarten teacher, I read thousands of children’s picture books and wrote/illustrated many stories in my classrooms. I could see the important role that children’s picture books play in students’ literacy development and how early connection with pictures books help students develop a love for reading. In 2013, I felt an urgency to pursue my life-long dream, to write and illustrate picture books for children beyond my classroom. I created a small publishing company, JeanneKay Publishing (jeannekaypublishing.com), a website (mrsjeanne.com), and promote my writing/illustrating by presenting to elementary schools/libraries. I am a graphic artist, with a fine artist background, and I love to work with color. I used my color skills, and ingredients that were truly natural and good for the skin to create Heavenly Hues Mineral Makeup line. My sister (Vanessa Berkesch-creator of Heavenly Scents), and I own Just Heavenly! which features Heavenly Scents bath and body, and Heavenly Hues mineral makeup. In my jewelry, I prefer to use the natural colors present in nature. I do my own lapidary work and watch as the colors pop out with a vivid beauty that rivals any enhancement we could produce. The warmth of copper is my first choice in metals, but I use sterling and brass if the piece seems to need that color instead. Each piece is individually created and my designs are all my own original artwork. I'm a retired woman that has been knitting for over 50 years. We travel a lot and if I'm not driving I'm knitting. Kim Vaughter is a painter and fabric artist living in La Crosse, Wisconsin. She enjoys colorful things, tattoos, red lipstick and working on expanding her ever-growing collection of paintings. Gitchi Gami Body Co was started by 3 friends who share a love for the North shore and handmade goodness. Gitchi Gami is the Ojibwe name for Lake Superior. One cold wintery Sunday, the 3 of us decided to spend the day making homemade body products which we really enjoy using and decided to share with others. 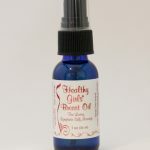 We use simple ingredients, no unnecessary chemicals and only essential oils in our products. Our products include handmade soap, lip balm, lotion bars, whipped body butter, intensive balm, relaxing bath soaks, and body scrubs. We hope you enjoy our products as much as we do! I am a photographer and artist who enjoys capturing life’s simple beauty and sharing it with others. My compositions are typically kept simple, allowing the subject matter to shine. I describe my work as ‘mixed media photography’. All of my images start as a photograph. I may then use different modalities, layers, textures, images, or color to create the mood or visual impact I am looking for. Sometimes the images are left untouched, and other times the end result looks very different from the original. I am originally from Eau Claire but as of July 2015, reside outside of Luck, WI. Hi I’m Ruth, a wife, mother, grandma, sister, teacher and artist. I started drawing and painting late in life falling in love with watercolor for it’s transparency and movement - Watercolor seem to paint itself. Experimenting with Acrylic is so fun with its texture and versatility. In both realistic and abstract art, I search for light and contrast. The art world is filled with exciting opportunities, new mediums and great ideas. Art like life is an experiment in learning. I enjoy the whole process. Its fun to hear the comments and stories other have around my work. I love introducing others to art as well as producing it myself. Humble Apparel Co. is a Minneapolis-based outdoor apparel and goods company with a focus on clean, modern design. We choose paddles over motors. Hikes over drives. Campfires and stars over city lights. All with family and friends. Our humble beginnings started in 2016 after we struggled to find modern apparel for the Boundary Waters Canoe Area, an outdoor place we love. We donate 7% of our profits to Boundary Waters Canoe Area conservation efforts and youth outdoor outreach programs. Brush melted bee’s wax on areas of fabric that are to be white. Dye it in the lightest color and wax. Dye, wax, dye, wax…. iron between paper to remove the wax. That is the process of Batik. It has kept me fascinated and enchanted for 40 years! Seth is an artist currently residing in the mountains of West Virginia. He grew up constantly traveling to Wisconsin to visit family and remembers those days filled with the smell of cedar, woody mazes, and friendly barn ghosts. He considers daydreaming essential, wonder imperative and an unyeilding reverence for life boundlessly indispensible. I started making soaps over 8 years ago, after my husband bought me a soap making kit. This hobby quickly became an obsession and I had soap lying around the house everywhere. My solution? I started a soap business. This business grew to include my sister (Jennifer Diedrick), who is the mineral make-up part of the business. Together, we have loads of fun traveling to several different craft fairs throughout Wisconsin & Minnesota.